This weekend in Kabul something very unusual happened - young Afghans fought for their right - to party. A rock 'n' roll festival held in Kabul brought Afghan youth together and gave them the opportunity to exercise their freedom of expression. While thankfully the concert was a success, it didn't come without some fears and risks. The Taliban prohibits all non-Islamic music, forcing bands to perform in small secretive venues. 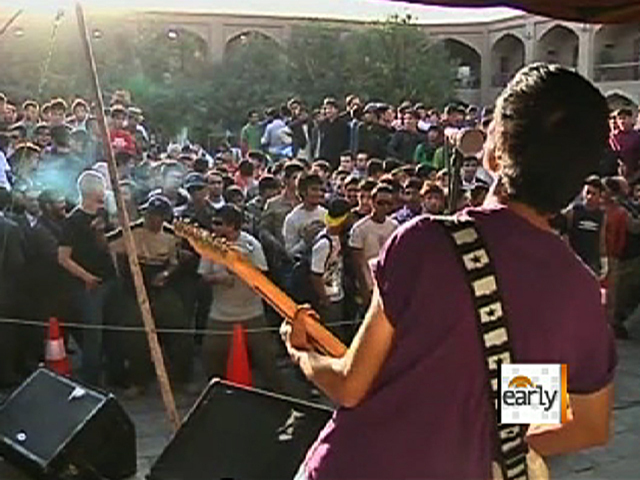 The concert, which featured ten acts from Central Asia and Australia, was put on by journalist and musician, Travis Beard in a small, enclosed park in Kabul. So how did Beard manage to safely pull this off? The date and venue of the rock 'n' roll festival were kept in secret to ward off any possible insurgent attack. CBS News correspondent Mandy Clark reports from Kabul, where she met with bands who have been forced underground, and the festival organizers who helped bring their music to the surface. One Kabul heavy metal band named District Unknown previously shielded their identities after a series of threats. But this time they decided to put it all on the line and reveal their identities in the name of freedom of expression. "If we are not talking about who we are and if we are not expressing ourselves, we are dead," said Nasram, the drummer of District Unknown. Watch the video to see the Afghan youth's mission.